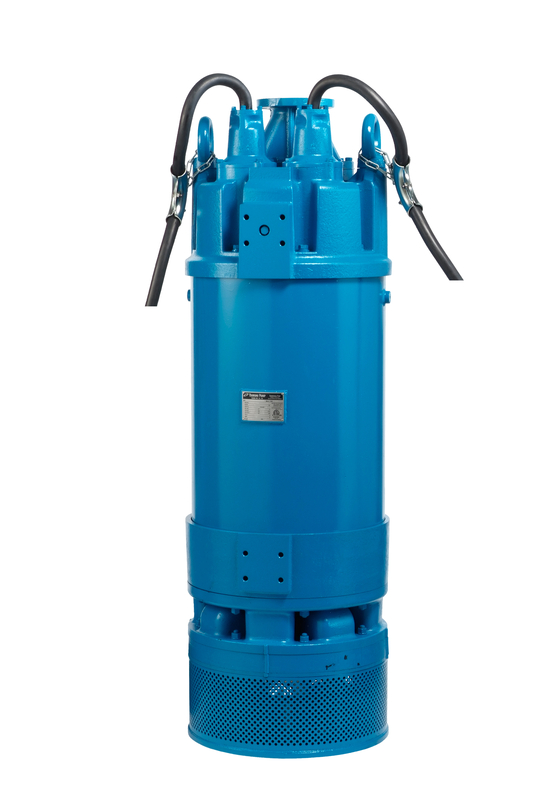 The blue painted high-pressure pump cannot be missed: It is an imposing phenomenon with a construction height over 1.8 m and a net weight of around 1.3 tonnes, but it impresses even more with its performance. The LH pumps water with particles up to 8 mm in diameter vertically upwards, reaching up to 216 metres. "This is the strongest performing pump of its kind offered by Tsurumi Europe," emphasises Product Manager Stefan Himmelsbach. The record holder was designed for water storage in very deep construction pits. It is also used wherever large horizontal distances have to be covered. "One pump is now enough in places where several used to be needed." In order to achieve this performance level, the manufacturer has equipped the star delta 400 V unit with a 110 KW electric motor. The pump casing is made of sturdy GG20 grey cast iron and the two closed non-clog impellers, arranged behind each other, are made of chromium cast iron. The double inside mechanical seal on the shaft in the oil tank, a special technical feature of the manufacturer, is made of extremely hard silicon carbide. Thanks to the water jacket around the motor housing, the motor is sufficiently cooled in semi-immersed operation. The centred flange reduces the diameter of the pump so that it can also be used in slotted bridge filters, for example. It generally runs in any position. Tsurumi is one of the few manufacturers to keep most of its 250 models, offered in Europe alone, available for immediate delivery from stock. Find out more online at Tsurumi.eu.